1. Preheat the oven to 200°C, gas mark 6. 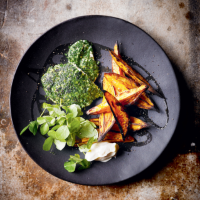 Place the sweet potato, cut into wedges, in a roasting tin and drizzle with 2 tbsp of olive oil. Cook for 25-30 minutes, or until tender and golden. 2. Meanwhile, slice each chicken breast horizontally through the middle to make two equal-sized pieces, then place on a board covered in clingfilm and flatten into escalopes with a rolling pin. 3. On a large plate, mix together the finely chopped parsley and lemon zest. Place each escalope in the parsley mixture, patting gently to completely cover each side. Heat the remaining oil in a frying pan and fry the chicken for 3-4 minutes on each side until cooked through with no pink meat. Serve with the potato wedges, green leaves and mayonnaise. This recipe was first published in Tue Sep 01 11:59:08 BST 2015.